I spent years researching numerous strains of bacteria, searching for specific strains that would provide a gluten-free and vegan alternative for the millions of people who are sensitive to dairy products. Orasana™ is proud to announce the release of, Orasana™ Probiotic mints that help reduce bad breath, plaque, and inflammation. 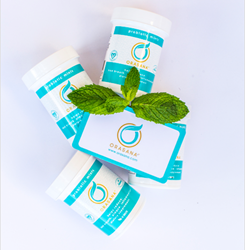 Orasana's probiotic mints are all natural, gluten free, preservative free, NON-GMO, vegan certified probiotic mint and contain no artificial flavors. Founder of Orasana, Dr. Sanda Moldovan is an award-winning periodontist, nutritionist, and oral health and wellness expert. “I spent years researching numerous strains of bacteria, searching for specific strains that would provide a gluten-free and vegan alternative for the millions of people who are sensitive to dairy products." Says Dr. Sanda. "In our mouths, there is competition between beneficial and harmful bacteria," says Dr. Sanda. "The ‘bad’ bacteria can cause gum disease, cavities, inflammation and bad breath, and it can spread all through out the body affecting the heart, the lungs, the joints, and unborn babies. The ‘good’ bacteria protect against the harmful ones and promote healthy teeth and gums to keep inflammation down. It has been proven through research that oral health issues affect much more than your teeth and gums. Heart disease, dementia,certain cancers, ​Alzheimer's disease, and ​D​iabetes have been directly linked to oral health issues." The Orasana™ probiotic mints delicately balance the bacteria in our mouths that are challenged by stress, what we eat, medications, illness, and how often we are able to brush. “The Orasana™ probiotic mints dissolve on the tongue, attacking bad breath, cavities, bleeding gums, and help alleviate symptoms of dry mouth," Dr. Sanda stated. "They are safe to take anytime day or night." Visit https://www.orasana.com/ for more information about Orasana™ oral health care products. Follow Orasana™ at @OrasanaLLC. About: ​Dr. Sanda Moldovan​ is the founder of Beverly Hills Dental Health and Wellness, is an award-winning periodontist, nutritionist, and world-renowned oral health and wellness expert. She tirelessly advocates non-narcotic alternatives for healing, which is the subject of her new book, Heal Up! Seven Ways to Faster Healing and Optimum Health, (Advantage / Forbes Books, September 2018). As one of the nation’s leading advocates for nutritional and homeopathic support for oral health and healing, she frequently appears on the Emmy-winning television show, “The Doctors”, as well as guest spots on “Inside Edition,”​​ and NBC News. She has authored articles for numerous scientific journals and contributed to major mainstream publications such as Reader’s Digest, Livestrong, Prevention, Men’s Health, The Dallas Morning News, The Huffington Post, Life Extension, and Well Being Journal. Orasana products are dentist formulated by board-certified periodontist and nutritionist Dr. Sanda Moldovan. ​She is ​convinced that your mouth is the gateway to your health​. A​s the developer of the Orasana product line, she continues to make significant advancements in achieving greater personal oral health care with probiotic supplements and home dental care products for adults and children​'​s teeth and gums. Dr. Sanda is passionate about producing safe, healthy, and natural products which are vital for improving overall health and wellness.